You roll over, and your first thought when you see the clock at 2:00 AM is, “Yes! I still have a whole night left to sleep!” This is a little gift from God as you snuggle back into your covers and the just-right spot on your pillow. Then the thoughts start. First there are just a few random flittering run-through concerns. But then, the next one leads to the next. Soon you roll over, and then roll over again. You look at the clock and it’s 3:00 AM. The dread settles. You calculate how many hours until the alarm goes off and how much sleep you will or will not get. If you are dealing with depression, you know that disturbance in your sleep cycle is often part of this difficult situation. You can’t sleep, which makes you tired and more depressed. On and on it goes. I’ve had insomnia many times during depression. 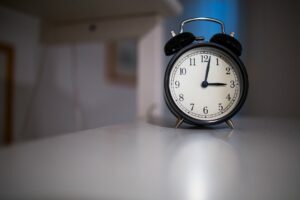 Not sleeping well is often one of the first signs that I know I’m “not doing well”, when I start a several days pattern of waking up in the middle of the night and not going back to sleep. 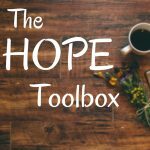 My friend and fellow blogger Sharon Jordan (Check out her blog here: I Dare to Be Happy) shared this wonderful concept with me about how to stop your rolling thoughts when you are stuck in a negative thought cycle. This works for middle of the night thoughts and during the day too. Whatever your brain is stuck on worrying about, choose something completely different to pray about every single time that thought enters your mind. Within 24 hours you will see a remarkable decrease in your worry about this problem or situation! A few months ago I was stuck worrying about a comment made by a couple co-workers. It was something small, really, but I just couldn’t get out my brain that they were laughing at me and talking about me behind my back. I ruminated on it. 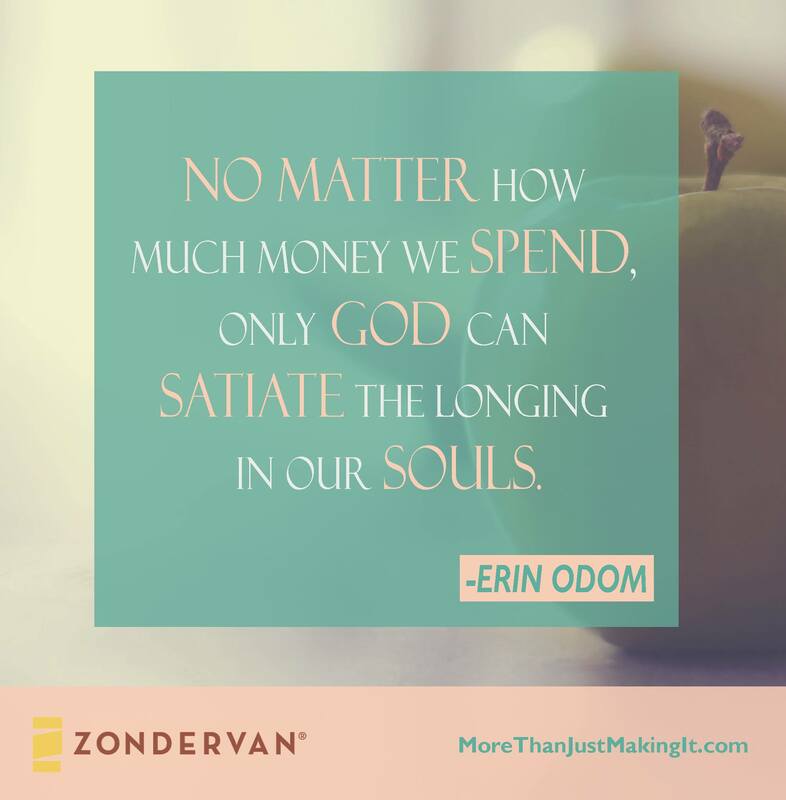 I took Sharon’s advice to heart and every time the thought entered my brain, I said a prayer about my daughter Bekah’s school situation, which I’m sad to say I had been lacking in prayer for. At that time we were waiting for Bekah’s internship placement. I’m happy to report she got the most amazing placement working in the culinary program at the Bronco stadium, Sports Authority at Mile High. God does indeed answer prayer! Maybe God used a totally different situation to nudge me into prayer where it was most needed. Try this concept, and let me know how it works for you! 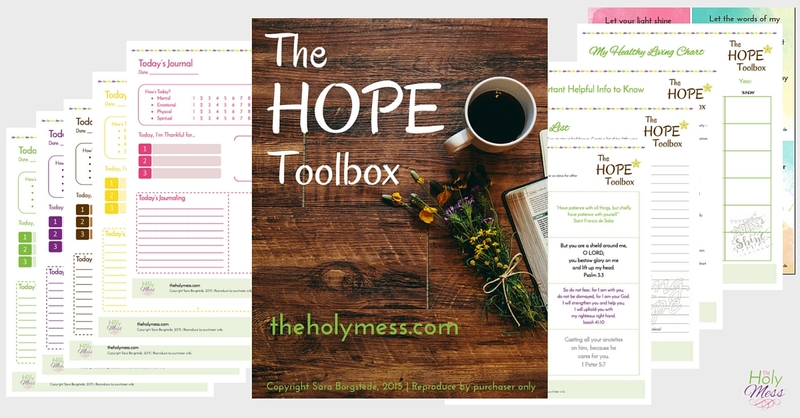 Have you checked out our My Hope Toolbox Printable Kit? 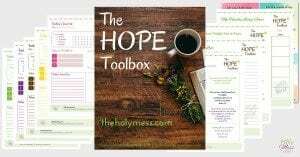 Over 20 beautiful pages to guide you along your path to healing and wellness. Do you have trouble with sleep? Where do your thoughts go in the middle of the night? What is something totally different from your worries that you can choose to pray about, starting tonight? NextDo You Have Secondary Traumatic Stress? This is a great idea. I’ve struggled with insomnia and depression too. I’m going to remember this tip. I’ve done this, too. I also recite to myself Scripture passages that I’ve memorized. Both practices help to calm my mind in the middle of the night.